If you are brave, use a straight edge! For many years, men only knew one way to shave. With a cheap, plastic disposable razor and cheap shaving foam. Some of us are old enough to remember arriving at work with little pieces of tissue dotted red with blood scattered all over our faces. But, if you perfect giving yourself a wet shave, you will be amazed at the results you will see immediately. Though a bit time consuming, wet shaving is not difficult. Shaving at home has greatly improved, no doubt, with the advent of the 5 blade, and now even 6 blades with the 6 blade Dorco Pace 6 Plus , cartridge razors. Those can give a nice smooth shave and leave fewer nicks. But even if you use a disposable razor cartridge system, you should do a wet shave. A shave can still be improved by doing a few small things and using some products. And if you are really serious about taking your wet shave game to another level then buying a shaving kit like this badger hair shaving brush set and a safety razor will do wonders. If you want to continue to use the disposable razors, then taking a few extra minutes will make a world of difference in your shave. The most important thing in getting a good close shave by wet shaving is having a couple of days of beard growth. Contrary to what might seem logical, you don't get a closer shave when your beard is short stubble. The key to a smooth shave is having the whiskers absorb a lot of water and the shorter the stubble the less water can be absorbed. I have guys occasionally come to the shop for a shave after having already shaved that day thinking it will help them get a closer, smoother shave. Not the case. If you can let it grow an extra day that is ideal. Of course some guys can't get away with that at the office, so it isn't dire if you have to shave everyday and still want to do the wet shave anyway. This is easier to do when you have a few days growth and can see what direction the beard grows in. Wait for the weekend when you can get away with growing it a bit. Check out how the beard lies. And make a mental note of the areas where the direction changes. On the first pass over, you want to go with the direction of the beard. Don't go against it because that will lead to nicks or ingrown hairs. Especially if you are using a straight edge or safety razor. You have all seen the old movies or cartoons with a man lathering up his shaving brush in a cup, then lathering it onto his face. It had been done like that for centuries before we started using the canned shaving cream. Skip the cans and take the time to do this. You will be amazed at the difference. This is very important. Shaving creams out of the can, or even worse, gels, don't have much or any water in them. They serve only as a lubricant to so the blade can glide across the face. When you use the soap and brush, you are really getting water into the stubble, raising the whiskers off of the face and opening up your pores. By taking 5 extra minutes to work the soap into the brush then lather the face you have already ensured a superior shave. To ensure a smooth, frictionless shave apply a pre shave oil before you begin the lather. You can buy the soap as a disk that rests in the bottom of the cup or bowl or as a cream that you apply directly to the brush. Work the soap up into a lather for a couple of minutes using hot water. Dip the brush into the hot water and then vigorously rub the lather onto the face. Do this for a few minutes to really work it in. Don't simply coat your face with the lather and begin to shave. If the soap on your face or the brush itself starts to get a bit dry then dip the brush into the hot water and keep going. If you don't want the bother of using the brush and soap method, then at least use a pre shave heating oil, like this Billy Jealousy Hot Towel lotion. Getting your face wet and hot will open the pores and get you a closer shave. Rub some of this into the beard before adding the shaving cream and you will notice it heat your face as if you just applied a hot towel when you get a traditional wet shave at a barbershop. Though it is called a safety razor , it is no joke. It is not as safe as using a multi-blade razor . You must still be careful with these as it is just a single blade directly on the skin. They are called safety razors because before they were invented, people used the cut throat straight edge razors. Compared to those the new safety razor was extremely safe! The best safety razor is one with good weight to it. You want the razor to do the work and use as little pressure as possible so the weightier ones will work much better. The one pictured above is a good one that I use myself. Once your face is prepped either by shaving brush and lather or just shaving cream, you can start by pulling the skin tight with your free hand. Pulling the skin is very important. If you don't, then the razor could drag resulting in a nice cut on your face. 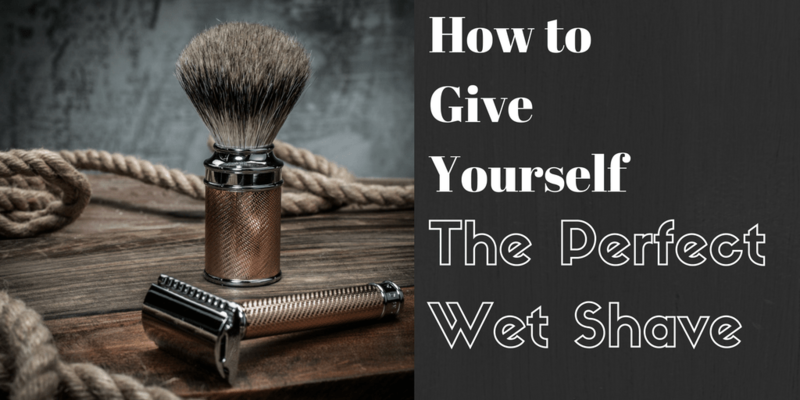 Start with nice easy strokes with the safety razor and rinse after each pass. Go with the beard direction. Don't be in a rush here. Taking your time will not only be safer, but will give you a much better shave. I don't really recommend using a straight edge razor to do your own shave. Unless you are ambidextrous. If you are using a straight edge razor on yourself, you can't really get the angle right with one hand while pulling the skin with the other. So you won't get a uniformly close shave with one. A wrong move, very easily done while looking in the mirror, could be disastrous. Only get one of these if you are truly committed! To make your life slightly easier, I recommend the kind that uses the same type of disposable blades as the safety razor. You simply use the razor and throw the razor blade away. Using a traditional straight edge razor that needs to be honed and stropped is something that most modern men have no time for. And if not properly maintained could do some serious damage to your face. This step is just as important as the earlier ones in ensuring a good shave. At the end of the wet shave you want to close those pores and tighten up the skin, effectively closing up the roots of the beard and covering the stubble. Which makes the skin nice and smooth. Rinse your face in very cold water and dry. You just removed the hair from your face so now add some to your chest by splashing some after shave on! After the initial wave of pain, you will feel refreshed and rejuvenated! There are thousands of different types to choose from so go with the one you like the smell of. I love Proraso products in general so that is what I use. If you don't like the shock of the after shave, try an after shave cream instead. Shop for After-Shave Products at The Art of Shaving. This might sound intimidating or even a chore, but adding this to your routine at least once a week will not only give you a closer, smoother shave, but it does wonders for your skin too. 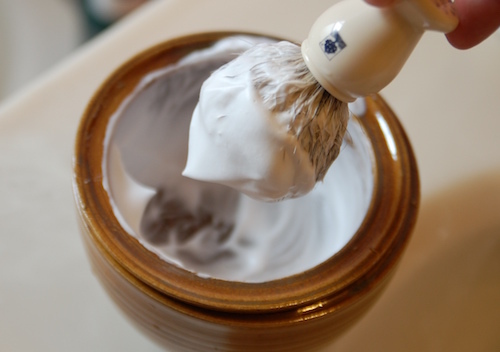 It improves circulation to do a traditional wet shave like this thereby leaving your skin much healthier. It's a good time to be a man these days. Taking care of yourself is back in vogue and it is fun to do some manly things like this and spoil ourselves! I know you have a friend or co-worker that could benefit from this article. I am constantly giving this same advice in the barbershop where I work. Make sure you click on one of the icons to the left to share this on Facebook, Twitter, Pinterest or whichever social media outlet you prefer.